内容简介：一、《中国社会统计年鉴—2014》是国家统计局编辑的一部反映我国社会发展相关领域基本情况的综合统计资料年刊。本书收录了2013年各省、自治区、直辖市社会发展各领域的主要数据和部分年份的全国数据。 二、本书共分10个部分。即:1.综合;2.教育;3.卫生;4.社会服务;5.新闻出版、档案;6.广播电视;7.文化;8.体育;9.残疾人事业;10.公共管理和社会组织。附录收集了主要统计指标解释和2013年全国教育经费执行情况统计公告。 三、本书资料分别来自于:全国人大、全国政协、最高人民法院、最高人民检察院、司法部、公安部、教育部、卫生和计生委、民政部、人力资源和社会保障部、文化部、新闻出版广电总局、体育总局、文物局、档案局、全国总工会、中国残联等部门。 四、有关符号说明。 “空格”表示该项统计指标数据不详或无该项数据; “#”表示是其中的主要项; “…”表示不够进位。 五、在本书编辑过程中,得到上述有关部门的大力支持与合作,在此我们表示衷心感谢。由于社会统计年鉴内容多、涉及范围广,在资料的整理和编排方面难免存在不足之处,敬请批评指正。 PREFACE 1 .China Soeial Statistieal Yearbook 2014 15 the comPrehensive statisties yearbook whieh refleets various asPects related to soeial develoPment edited by National Bureau of Statistieal of China.It 15 eollected main soeial statistical data on Provinees and national total data in 2013. 11.The Yeathook ineludes 10 seetions:l.General Survey， 2.Edueation，3.Public Health，4.Soeial Service，5.News Publieation and Arehive，6.Radio and Television，7.Culture，8.SPorts，9.Undertaking for Disabled Persons，10.Publie Administration and MembershiP Organization.In addition， exPlanatory notes on main statistieal indieators and Statistical Communique of National Edueation Funds in 2013 are Provided at the end oftheyearbook. 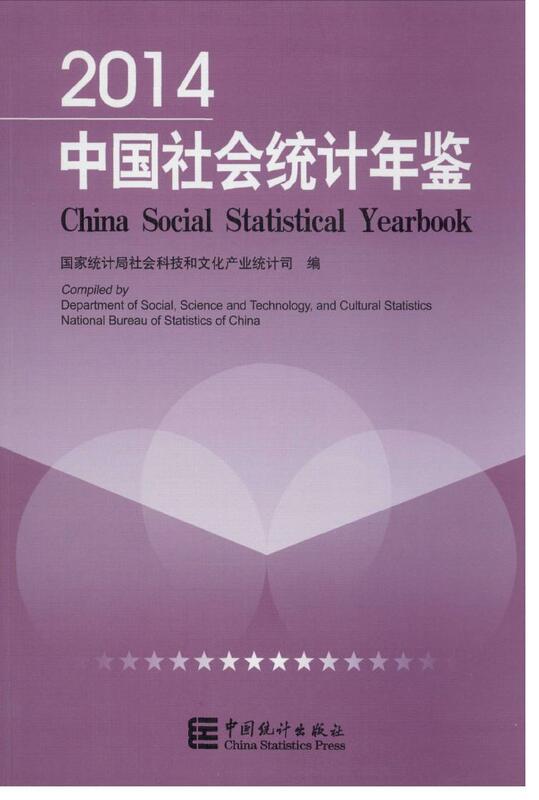 111.Data in the Yearbook are soureed from the following dePartments:the National PeoPle’s Congress，National Committee of the Chinese PeoPle’5 Political Consultative Conferenee，SuPreme PeoPle’5 Court，SuPreme PeoPle’5 Procuratorate，Ministry of Justiee，Ministry of Publie Seeurity， Ministry of Edueation，National Health and Family Planning Commission，Ministry of Civil Affairs， Ministry of Human Resources and Soeial Security， Ministry of Culture，General Administration of Press and Publieation，Radio，Film and Television，General Administration of SPorts，the State Archives Administration，All一China Federation of Trade Unions，China Disabled Persons’Federation， CtC. IV Notations used in the yearbook. “blanLk sPaee，’indieates that data are un知own or are not available: “#，，indieates a major breakdown ofthe total: “…”indieates that data are not enough to carry. Vl.Our deeP aPPreeiation goes to many dePartments which Provided suPPorts in eomPiling this Yearbook.It 15 inevitable that there might be some mistakes in the book because of wide coverage involved in eolleeting and eomPiling social statisties.Suggestions from readers are welcome 50 as to imProve the quality of this Publieation in the future.